Visitors to Lexington, Virginia, can see the site of the old Lexington Presbyterian Church in the Stonewall Jackson Memorial Cemetery on South Main Street on the edge of town. The church was built in 1789, and the cemetery grew up naturally around the church. General Thomas J. “Stonewall” Jackson, 144 Confederate veterans, Revolutionary War veterans, two Virginia governors (John Letcher and James McDowell) and Margaret Junkin Preston, the Civil War Poet Laureate of the South and wife of Colonel J. T. L. Preston – one of the founders of VMI, also are buried here. Other notables interred at this cemetery include John Mercer Brooke, the designer of the ironclad ship C.S.S. Virginia (known by its former name, Merrimack); General William N. Pendleton, Lee’s Chief of artillery, and early presidents of Washington College and Virginia Military Institute (VMI). An informational marker posted just inside the main gate to this cemeter6 lists many of famous and interesting people buried in the cemetery and locates their graves. The statue of Stonewall Jackson was sculpted by Edward V. Valentine and dedicated July 21, 1891. Jackson and his family are buried beneath the statue. While in Lexington, you can also visit Edward Virginius Valentine‘s other works. He sculpted the Robert E. Lee memorial in Lee Chapel at Washington and Lee University in Lexington, Virginia. In a successful artistic career that spanned 50 years, Edward Valentine worked in clay, plaster, marble and bronze to produce portrait busts, ideal figures and monumental public sculpture. 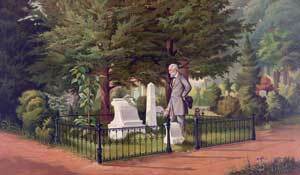 The image above illustrates Lee “on a last visit to Stonewall Jackson’s grave.” See the original at Wikipedia.